Background: Traumatic brain injury (TBI) is the leading cause of death and disability among children and young adults worldwide. The 5-HT2C and melatonin receptors are known to have involvement in memory functions. 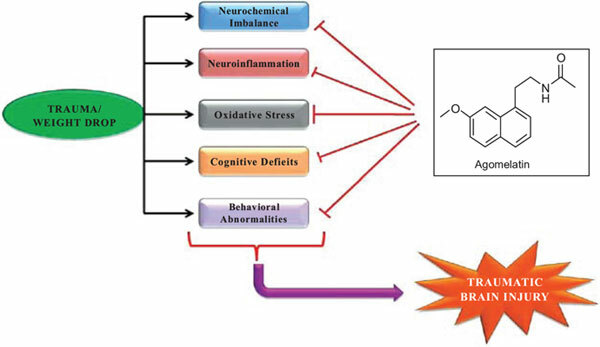 Objective: To find the beneficial effect of agomelatine against weight drop induced TBI in rats. Method: The weight-drop model closely mimics the real-life TBI. The injury was induced by dropping a weight of 450 gm from a height of 1 meter through a hollow metallic tube onto the exposed skull of rats under anesthesia. After 14 days of TBI, the agomelatine (10, 20, and 40 mg/kg p.o. daily) treatment was given for next 14 days (i.e. until 28th day). The cognitive impairment was observed in Morris water maze (from 24th to 28th day) and novel object recognition (on 27th and 28th day) test. Immediately after behavioral parameters, animals were sacrificed and hippocampus and cortex were isolated for biochemical, neuroinflammatory and neurochemical estimation. Results: The weight drop model significantly induced memory impairment in TBI rats that has been assessed by Morris water maze and object recognition task. A significant rise in acetylcholinesterase activity, neuroinflammatory markers, oxidative stress was found in both cortex and hippocampal regions of traumatized rat brain. While agomelatine (10, 20, and 40 mg/kg p.o.) treated rats have shown memory enhancing effects dose-dependently, as compared to TBI control rats in Morris water maze as well as novel object recognition test. Further, agomelatine treated rats have shown a significant increase in serotonin, dopamine and norepinephrine levels in TBI rat brain. Conclusion: Agomelatine treated rats have been shown to alter the cognitive deficit due to TBI by enhancing the memory as shown in Morris water maze and object recognition test, as well as a substantial rise in neurotransmitters, suggesting that agomelatine may possess memory-enhancing effects. Hence, we deduce that agomelatine may represent a promising new neuroprotective drug for cognitive enhancing effects in TBI. Traumatic Brain Injury, agomelatine, 5-HT2C, weight drop model, cognitive deficit, neurotransmitters.